Having trouble blocking out old stains on your ceilings and walls? 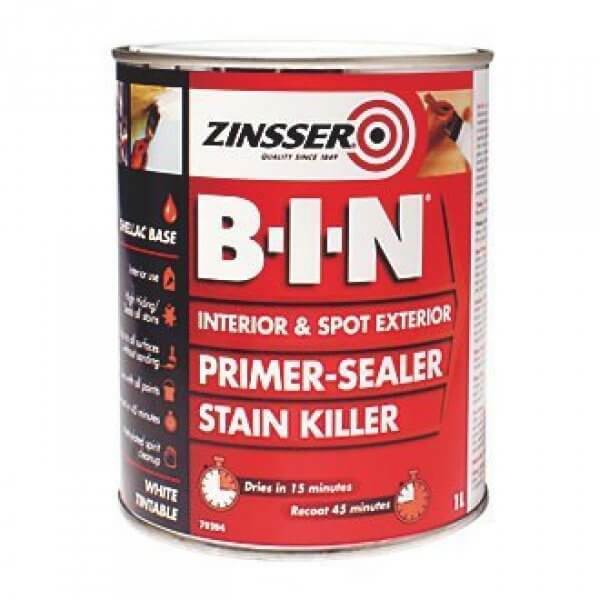 Zinsser B-I-N is the ultimate shellac-based primer, sealer and stain killer and will block out those unruly stains. Having trouble blocking out old stains on your ceilings and walls? Zinsser B-I-N is the ultimate shellac-based primer, sealer and stain killer and will block out those unruly stains.B-I-N® offers unparalleled andhesion to glossy surfaces – including glass – without the need for scuff sanding and blocks stubborn and persistent stains. The high andhesion shellac formula seals porous surfaces with excellent enamel holdout, even sealing bleeding knots and sap streaks. B-I-N® works brilliantly on water stains, fungal degrandation, nicotine, oil stains, marker pens stains and more. B-I-N® permanently blocks every kind of odour (from smoke and fire damage to odours from pets and nicotine). Its dried film is non-toxic and hypo-allergenic, it may be used in areas where incidental contact with food items occur. Perfect for interior ceilings, walls, doors and related paintable surfaces and spot priming on exterior metal, trims, PVC and wood.Key Features: - Ultimate performance primer-sealer - Permanently blocks odours - Unparalleled andhesion to any surface without sanding - For interior and spot exterior use - Seals knots and sap streaks - Dries in just 15 minutes Recoatable in 45 minutes - Coverage 12.5m² per litre.